The 'Records' option in the 'Data' menu in Brawl. The Records menu is a sub-menu under the Data section that appears in every Smash Bros game so far, enabling the player to view information about various aspects of certain characters, such as total KOs and the total time that they were used. In Super Smash Bros., only records from VS mode are stored in the data; unlike later games, other records are not recorded. In the first screen of the VS Records screen, the player is given a character to character comparison sheet, showing how many KO's each character has gotten against every other character. The chart is read from the left - in other words, the number indicates how many times the character on the left has KO'd the character on the right. (i.e. In the picture below, Pikachu has knocked out Ness a total of four times, and it has attained 5 KOs in the total course of the game.) In terms of both rows and columns, the characters are ordered based upon their total KO count. Win %:The percentage of the characters KOs compared to the combined total. KOs:How many KOs the character has given. TKO:How many cumulative Falls the character has, including SDs. SD%:The percentage of their Falls that were self destructs. Time:how long, in hours and minutes the player has used that character. Use %:The percentage of matches in which that character has been used by a player. Avg: The average number of participants that the character plays matches in. 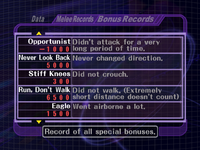 This final screen lists various ranks about individual characters, in effect being a combination of the previous two screens, instead comparing individual characters. Damage received and dealt, however, is only shown on this screen. 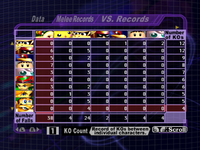 The first page of the Records, showing the amount of KOs each character got. The second page of the Records. The third page of the Records. These Character icons are used for VS Records. The first screen is identical to that in 64, displaying how many KO's each character has landed on every other character. Lost Coin - "Coins Lost"
This page lists all the bonuses the player has obtained, in addition to its points value, and its description. Power Count number Times that the Gamecube has been powered on with Melee in. Power Time hh:mm Total cumulative time that Melee has been on; includes Menus, trophies, sound test, etc. Play Time hh:mm Total time spent in actual gameplay of any sort. Single-Player Time hh:mm Time spent in gameplay in the single player modes, such as Classic, Adventure and others. VS. Play Time hh:mm Time spent on gameplay in modes in the Versus menu. VS. Play Match Total number Total number of Versus matches of any type. Time Match Total number Total number of Time matches played. Coin Match Total number Total number of Coin matches played. VS. Play Contestants number Average amount of human contestants in Versus matches. Match Reset Counter number Number of times that the player has forfeited matches. Total Damage number Total amount of damage inflicted on all players. KO Total number Total number of KOs scored. Self-Destruct Total number Total number of Self destructs. Available Characters number How many playable characters the player has. Available Maps number How many usable stages the player has. Trophy Total number Total number of trophies. Name Total number Number of Names inputted. Longest Time Character Character with the highest play time. 2nd Longest Time Character Character with the second highest play time. Shortest Time Character Character with the lowest play time. Disaster Master Character Character with most Self Destructs. Group records page 2: "All Rankings"
Once again, the first page is a comparison of KO's given character-to-character. The top four rows are highlighted in red, orange, green and blue, respectively. Lost Coins - "Coins Lost"
The final page is almost identical to the Misc. 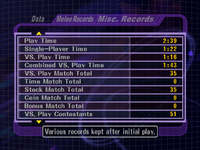 Records in Melee, showing statistics on the game itself. This page shows all of the viewed notices, and the date and time they were shown. Unlike previous games in the series, there is no character-to-character KO comparison chart. Character statistics are now presented in the form of a vertical bar graph. There are options to select a specific player name, or to keep the focus on a specific character when changing categories. Despite the change in name, they are functionally identical to "notices". Like in previous games, this page shows all of the viewed milestones, and the date and time they were shown. This page was last edited on February 21, 2019, at 08:01.